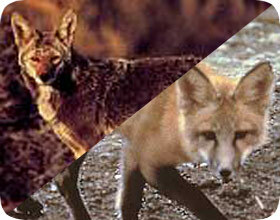 We specialize in solving problems/conflicts with wild animals, including fox or coyote. We know there are many coyotes in the Chicago area, and we can trap and remove them for you. We can offer a solution to keeping coyote or fox away from a designated property. Learned while attending Wildlife 101 with IDNR instructors last fall. About Illinois Coyote: Appearance, biology, life cycle, habitat, diet, behavior - who traps coyotes in the city of Chicago? Coyotes are one of the most dangerous wild animals in the mammal family in the Chicago region, primarily because they are ruthless animals and they like to hunt in packs. If you see one coyote you can be sure that others are not far away and, if that is the case, you may want to try to get away from the area as fast as you can. Coyotes come from the same family as the dog and are native to North America. They spread as far as to Southern Mexico, but are not found in many other areas than this. Because of a lack of food sources and increasing encroachment of humans on their lands, coyotes are starting to spread into Central America, and could reach as far as South America within the next few centuries. These animals are extremely predatory, and if in a large enough group and if sufficient enough, they will challenge virtually any animal. Most think that it is the strong sense of smell that is the primary sense used to hunt for food, but auditory and visual perception play just as much importance. Coyotes have a strong eye sight, and are very adept at detecting motion, which is a key to their hunting success. Most Chicago coyotes hunt in pairs or small groups. The younger pups will at times hunt with the pack, but when larger animals are being stalked they are left out. It is often the case where a paired tandem of coyotes, i.e., a male and a female will hunt together. It is believed that this not only increases the bonding between the two, but also gives the male the opportunity to demonstrate its prowess. Common animals that are hunted include rodents, squirrels, porcupines, raccoons, bunnies, and other forms of small mammals. It is in hunting porcupines that Illinois coyotes prove how smart they can be in their ability to find and eat what they have caught. Coyotes are wise enough to be able to tip the porcupines over onto their backs without being poked by the quills. Coyotes in urban or city areas will scavenge. Call us any time for Chicago coyote removal and trapping services. In one of the oddest relationships, coyotes will often pair with a badger in an alliance to gather food. Usually the two animals are attempting to dig out rodents that both want to eat, and they are willing to work together to get this food source. As a means of marking their food, coyotes will often urinate on their food. The average male coyote gets to be about 18-44 pounds. Females traditionally weigh approximately 15-40 pounds depending upon species of coyote. The length can be about five feet from snout to end of tail, with the largest known coyote (found in Wyoming) reaching five foot-three inches and weighing nearly 75 pounds. Coyotes are covered with a very coarse hair that not only helps to keep them warm in the winter, but also protects them from being easily attacked by predators of the coyote. The coarse feel to the hair can actually be an irritant to predators. The hair in northern coyotes is thicker than that of southern ones, giving them a thicker coat to battle against the extreme colds of the northern most parts of North America. The word coyote comes from the Nahuatl word coyotl which was coined in Mexico in the late 1700s. Illinois Coyotes may also be referred to as brush wolves, prairie wolves, and cased wolves. The American Jackal is another common name. Coyotes traditionally live in small communities, that are centered around a nuclear family, much in the way that a father and mother may have their children living with or near them. Unrelated coyotes are usually welcomed to the social group, and usually have equal standing in the community. There are cases where a small group of unattached coyotes may live together, but these �non-familial� groups usually do not last long. A pair of Chicago coyotes will traditionally �court� one another for about two to three months before copulation occurs. The female informs the male that she is ready to engage in mating by howling with increased frequency, a sign to the male that she is ready for him to mate with her. The female selects a specific male she wishes to mate with and once that occurs the rejected males are not welcome near her. Once she is impregnated the female with stay to one male, but until that occurs she will allow up to seven other males to follow her around, and she will copulate with others at her pleasure until she is impregnated. The gestation period for a coyote is 63 days, and a female can have up to six pups at a time. The survival of pups depends on the population density and the availability of food. Most pups are able to walk by 20 days, and will begin running at six weeks. They can survive on their own after about three months, but will usually remain with their nuclear family until they find a mate. We are happy to trap coyotes in Chicago. We are a professional wildlife and animal removal company.